In our never-ending search for the best total solar eclipse experiences, TravelQuest journeys to the ends of the Earth. And if the eclipse track crosses over the 70 percent of our planet that’s covered in water, we’ll even charter a small, nimble ship that can get us exactly where we need to be: not that there’s ever just one viewing spot along the path of the Moon’s shadow. There will always be other places to observe the classic features of totality – the corona, Baily’s beads, the diamond rings and more – maybe even for a longer time. But for us, that’s not what defines a great eclipse journey. Especially when there’s a chance to witness a brief but extraordinary phenomenon you’d rarely experience anywhere else. 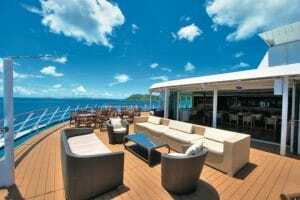 This was the inspiration behind our December 2020 adventure, South Pacific Cruise to Totality. 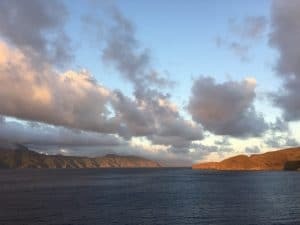 Imagine waking before dawn and strolling out on deck just as the first glow of the Sun appears along the ocean’s distant edge. Above the glow, Venus is blazing away, heralding Sol’s imminent arrival. What you see next, though, is not the usual flaming disc but the oddest sunrise you may ever witness – a brilliant orb, emerging from the sea, with a bite taken out of it. Soon the rising Sun is in full eclipse, a fiery red ring around a disc of solid black. Totality is fleeting, just over half a minute, as you stand in silence – feeling the ship roll gently in the vast expanse of sea while you gaze, awe-struck, into the vast expanse of the heavens – the purity of those moments will stay with you forever. At the heart of this once-in-a-lifetime trip is a simple concept: explore the crystal lagoons and jungle-covered peaks of remote Polynesian archipelagos, keeping one eye on the heavens while experiencing a spectacular taste of paradise right here on Earth. 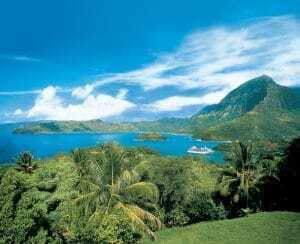 On December 5, 2020, join us as we set sail for 15 days aboard our privately chartered cruise ship, the 330-passenger M/S Paul Gauguin – named for the post-Impressionist painter who traveled to French Polynesia at the turn of the 20th century and was inspired to create some of his most renowned masterpieces. 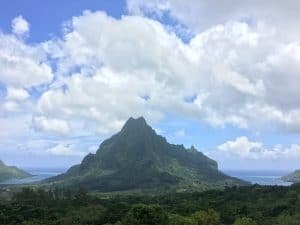 In the same spirit of creative curiosity, you and a small group of TravelQuest guests will visit the Marquesas Islands and many of Gauguin’s other favorite haunts, discovering the rich culture and warm hospitality that have led so many travelers since to conclude that Polynesia offers the ultimate escape from the ordinary. And then on December 14, you’ll rise with the Sun to witness a spectacle that few will ever see – all the more memorable for being so fleeting. 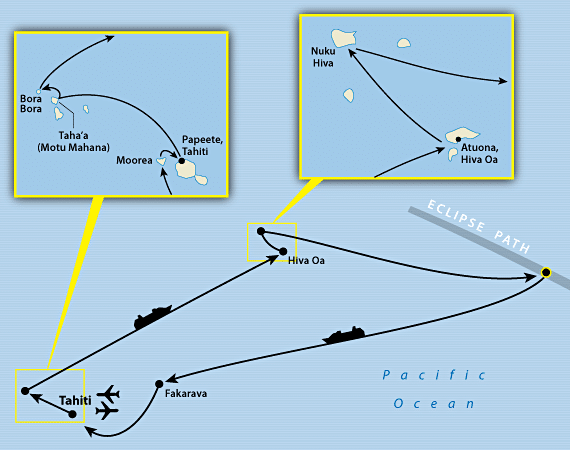 During the sunrise total solar eclipse on December 14, 2020, the Moon’s shadow will mainly pass over the Pacific Ocean – including a point north of the untamed beauty of the Marquesas Islands. The Sun will actually rise with a broad notch missing from its disk, as the partial phasesof the eclipse will have begun 20 minutes before the solar disk crests the horizon. Just over 33 minutes later, the Moon will cover the whole of the solar surface and totality will begin. As darkness descends, Mercury will hang just 3 degrees above the Sun while brilliant Venus shines from a 30 degrees altitude. The eclipse is a short one—about 38 seconds—just enough time to complete photographs and enjoy a view of this spectacle and its planetary attendants. Short eclipses showcase the Sun’s chromosphere by giving the dark Moon a brilliant red border that stretches most of the way around the lunar limb. The chromosphere is the region where the Sun feeds energy into the corona—a region that is still a bit of a mystery. 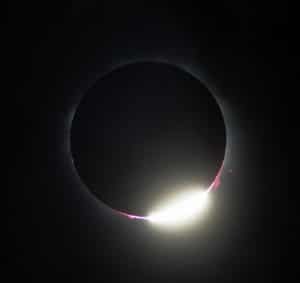 Longer eclipses show the chromosphere for only a few seconds at the start and end of totality, but for this one, it should be visible for the whole of the 38 seconds. Low-level eclipses also come with a marvelous shadow stretching from the Sun – an ephemeral connection between the observer and the solar system. Time-lapse video will show the black circle of the eclipsed Sun moving across the width of the shadow during totality, a spectacle that is not seen at eclipses where the Sun is higher in the sky. One of the big questions about low-altitude eclipses is the effect of clouds along the horizon. The Pacific viewing site for this eclipse has been chosen to take advantage of the low cloudiness associated with the South Pacific anticyclone (high-pressure area) that lingers just north of the shadow track. It’s a good spot: analysis of the past 13 years of satellite data shows that in 8 of them the eclipse would have been visible from the viewing site, and three more would require a movement of 10 miles or thereabouts. Only two of the thirteen had extensive cloudiness that would probably have clouded out the spectacle. 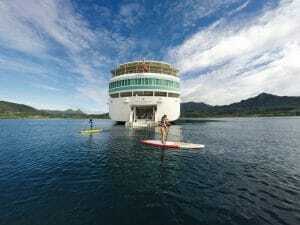 This is your opportunity to experience the ultimate in relaxation while discovering pristine tropical sanctuaries, fascinating Polynesian culture and the elusive beauty of a sunrise total eclipse at sea. Our private cruise is bound to sell out, so make your stateroom selection today – and join us for an unforgettable adventure. Among the stunning islands of French Polynesia, a collection of more than 1,800 volcanic atolls strewn across the South Pacific, the largest and most renowned is Tahiti, “Queen of the Pacific” – and you’ll soon see why that royal title is so well deserved. 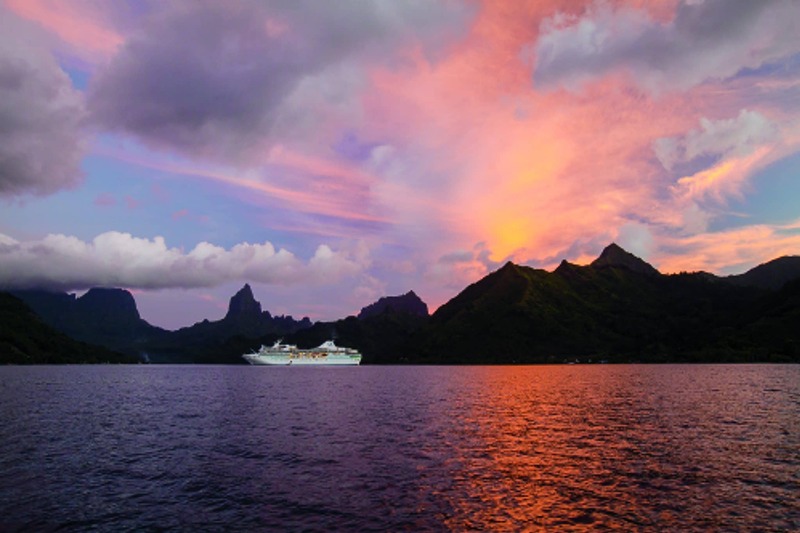 Blending spectacular natural beauty with a fascinating history, it’s the kind of exotic locale that immediately comes to mind when you hear “island paradise.” Landing at Tahiti’s Faa’a International Airport (code: PPT), you can take a taxi directly to the cruise terminal pier and our waiting ship, the M/S Paul Gauguin. Embarkation is scheduled from 15:00 (3:00 pm), and we sail at 23:00 (11:00 pm). Choose among three fascinating shore excursions today – or simply relax on our own private islet, Motu Mahana, where you can enjoy swimming, snorkeling, kayaking and unwinding on the beach with a drink from the floating bar. 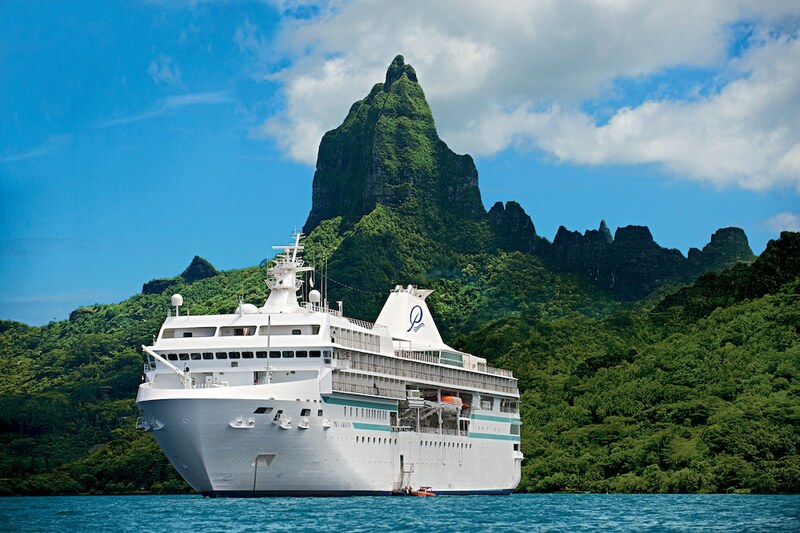 Add in a delicious seaside barbecue of local specialties, plus traditional Polynesian music and crafts presented by Les Gauguines, and you have the perfect first day of South Pacific cruising. We arrive in Bora Bora late in the evening. A longstanding dream destination among seasoned adventurers, Bora Bora, with its jungle-clad peaks, hidden lagoons and white sand beaches, seems to have been created for photography. Among the iconic natural features you’ll want to capture is Mount Otemanu, whose forested slopes rise steeply from the shore. As for the island’s roughly 4,000 inhabitants, they have a gracious, laid-back spirit that will inspire you to relax and take in all of that unsurpassed beauty. As we sail the South Pacific, the breathtaking vistas are matched only by the sense of peace that comes in realizing how far you are from the usual pressures and cares. When not just relaxing, taking in the ocean views and enjoying our ship’s many amenities, you can gain new insights into astronomy and Polynesian culture through our experts’ daily presentations. High above the roar of the Pacific surf, the mountains of Hiva Oa are almost perpetually shrouded in mist. This is the largest and most fertile island in the southern Marquesas – a place of deep valleys, thick rainforest and plateaus covered in exotic flora and lush vegetation. The main town, Atuona, is a favorite port of call for yachters dropping anchor in Traitors Bay. Paul Gauguin, who captured many scenes of village life in his paintings, lived here in his final years and is buried nearby. 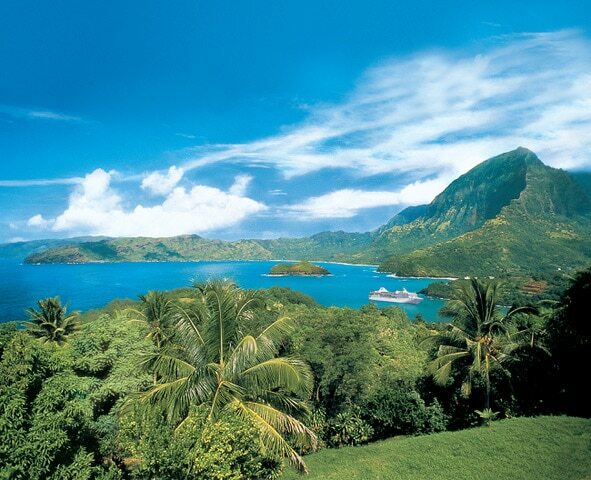 A charming seafront village, Taiohae is the administrative and economic center of the Marquesas and your gateway to beautiful Nuku Hiva, “The Mystic Island,” with its lush valleys, cascading waterfalls and ancient ruins above surreal blue bays. 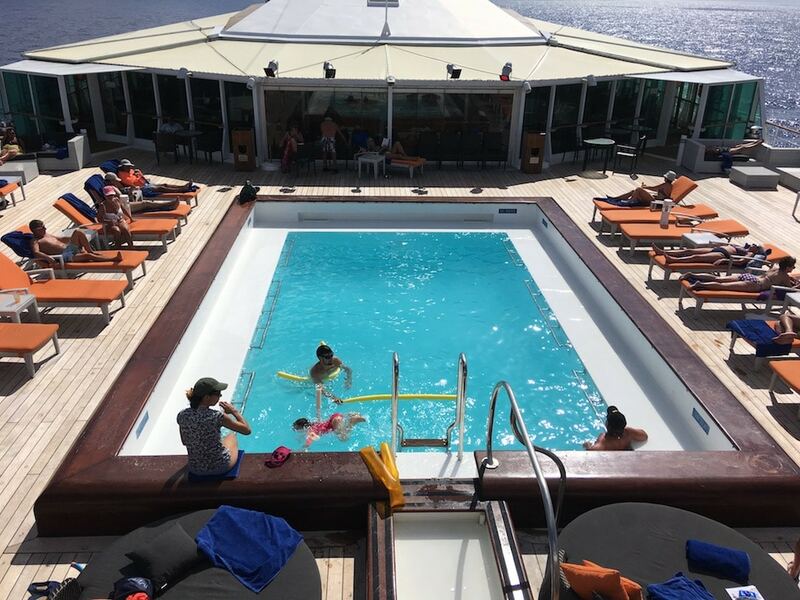 Look forward to more peaceful sailing across the glittering Pacific, enjoying the Paul Gauguin’s three dining venues, extensive spa facilities and five-star service. Once again, our onboard experts share their knowledge of the region and the astronomical highlights of the vast Southern sky. 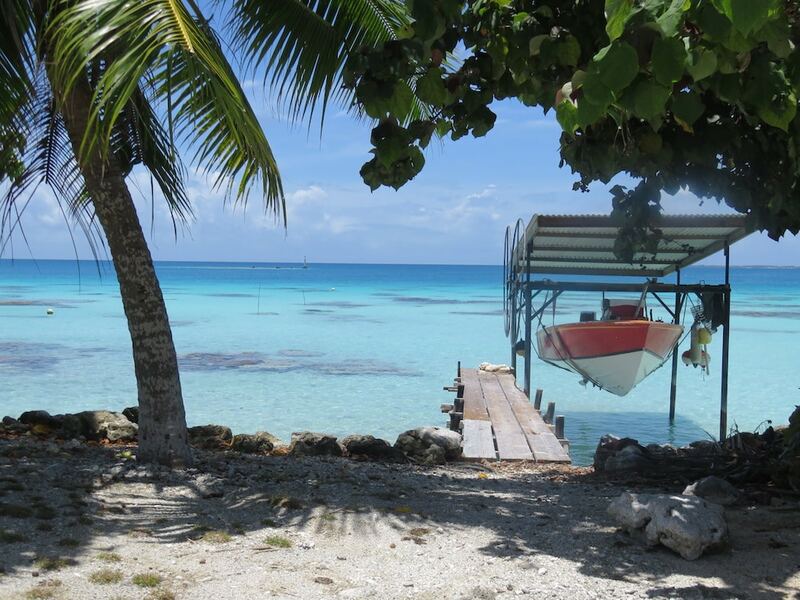 An unspoiled atoll in the western part of the Tuamotu group, Fakarava has been designated a UNESCO Biosphere Reserve to protect the many rare species that live there, both above and under the water. 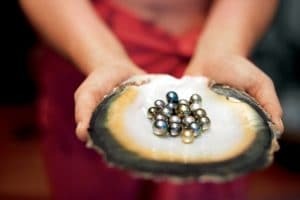 During your visit, blend nature hikes with cultural discoveries as you explore charming villages, ancient temples and a historic missionary church constructed entirely from coral. 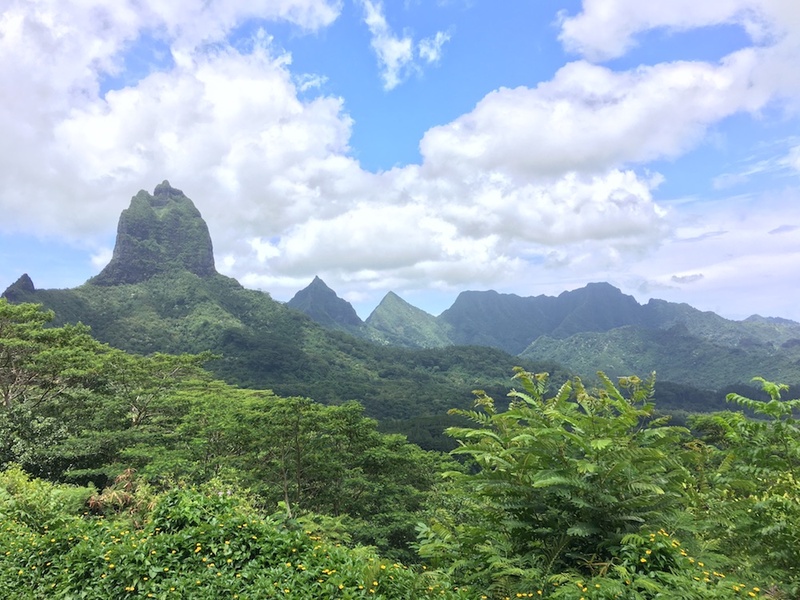 Moorea, often compared to James Michener’s mythical Bali Hai, appears on the horizon like a lost island from some classic fantasy novel, its volcanic peaks rising like a line of broken teeth above the palm-lined beaches of Cook’s and Opunohu bays. 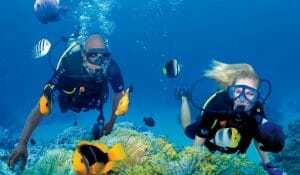 And beneath the waves, in waters justly celebrated by divers, you’ll encounter an even more magical world of dolphins, tuna, sharks (from a safe distance) and schools of iridescent fish. 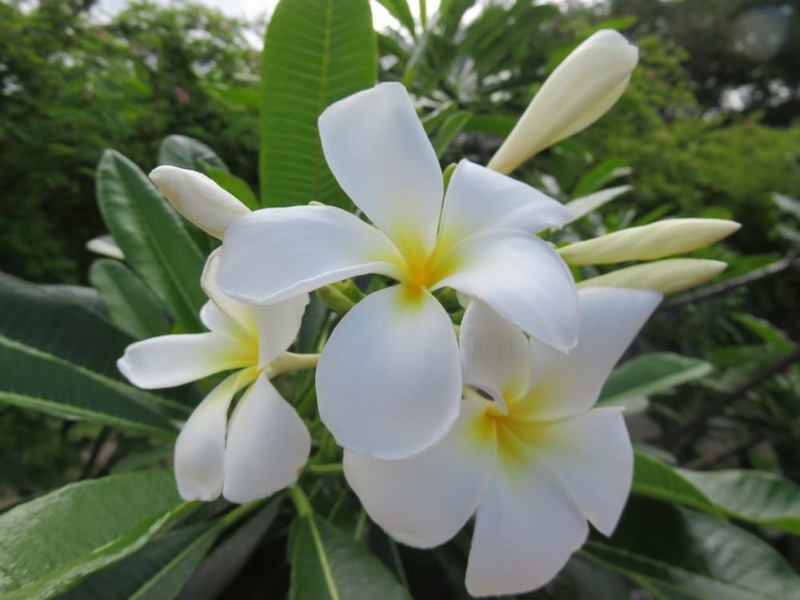 After breakfast, head ashore for travels onward from Tahiti’s Faa’a International Airport. 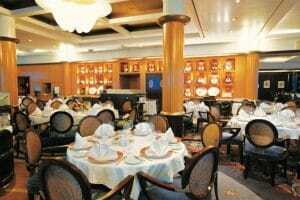 Internet Wi-Fi access throughout your entire cruise. In-room movie channels and movies available. If you are traveling solo, you can realize significant savings by taking advantage of TravelQuest’s Room Sharing Program, which matches travelers of the same gender so they can share twin-bedded accommodations. Although we will do our best to fulfill your request, if we cannot find a match, you will have to pay 200% of the double occupancy price. 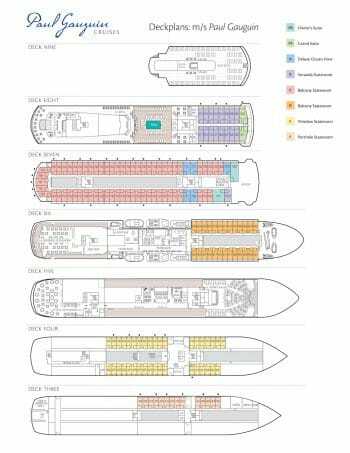 Complimentary beverages, including fine wines and premium spirits, soft drinks, bottled water, coffee and tea served throughout the ship. Air travel to and from Tahiti (Airport code: PPT) (see below); passports & visas; luggage handling to and from the ship; possible air and cruise fuel surcharges; shipboard Connoisseur Bar List beverages; shore excursions; and items of a personal nature including spa, boutique and laundry services, etc. ; and recommended trip cancellation/medical insurance. 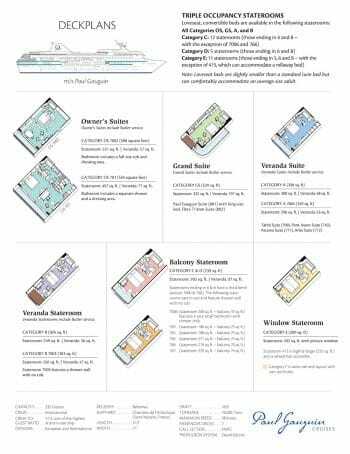 Using Paul Gauguin Cruises’ special air program, (schedules and fares will be provided in early 2020) will assure you’ll not miss the boat! Where available, this program offers guests the opportunity to upgrade to First or Business class. Carriers and routing are at the discretion of Paul Gauguin Cruises. Requests for specific routing and/or carrier may result in an additional charge. Air rates are subject to change until ticketed. An advance payment of $2000 USD per person and a completed Reservation Form are required to secure your reservation. A second advance payment, equal to 40% of your invoice total is due February 5, 2020. Your balance payment in full is due August 5, 2020. TravelQuest reserves the right to treat a reservation as cancelled if payments are not received when due. TravelQuest reserves the right to treat a reservation as cancelled if payments are not received when due. Cancellations made from the time of booking through September 4, 2019, will incur a $1000 USD per person cancellation fee. 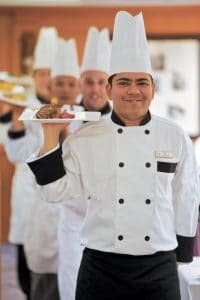 Cancellations made between September 5, 2019 – February 4, 2020, will incur a $2000 USD per person cancellation fee. Cancellations made between February 5-August 4, 2020, first and second advance payments are non-refundable. Cancellations made after August 4, 2020, full cruise cost is non-refundable. If TravelQuest is able to fill your cancelled cabin prior to August 5, 2020 you will be refunded your payments to date, less $1000 per person.